The history of cartography is replete with violence. The simple act of penning a line on a map—think of the Pakistan-India border—can create political antagonisms over which wars are fought. The drawing of maps can be used as a tool in the expropriation of land and resources by the State or corporations, depriving people of access to common resources. Yet there is an alternative movement, one whose past and present incarnations have much to offer activist struggles. As the great historian of cartography J. B. Harley suggested, maps are “images with historically specific codes,” the role of which often has been either to exert or to challenge power. What place, then, might radical cartography have in political struggles and why should it be a part of an activist’s toolbox? Reflecting in later life on the publication of his Outline of World History, H. G. Wells wrote that “in Mr J. F. Horrabin, the author has had the good fortune to find not only an illustrator but a collaborator.” Horrabin’s maps, Wells added, “are a part of the text, the most vital and decorative part.” By the late 1920s, Horrabin had become arguably the most widely-known cartographer in Britain, referred to in advertisements in the Times Literary Supplement as “the man who makes maps speak,” and at the same time a well-known activist on the radical left. In Working Class Education, co-written with his then-wife Winifred, Horrabin wrote that his interest was in “a particular kind of education, aiming primarily at meeting the specific needs of workers as a class, and undertaken by workers themselves independently of, and even in opposition to, the ordinary existing channels.” For Horrabin the production, circulation and consumption of geographical knowledge and facts was not an innocent pursuit. Instead, he believed, it was central to the political and economic project of capitalism to render certain geographical facts more important than others. To challenges this, Horrabin tasked himself with using cartography as a tool to foster the emergence of radical political alternatives to capitalism. Horrabin was not concerned simply with the dull and lifeless transmission of geographical facts. Indeed, in one of his most famous maps, Production and consumption: A Map of the World (1921), he deployed biting satire to attack the illogical dynamics of capitalist production and its circulation of resources and goods. Yet, Horrabin’s maps themselves were often aesthetically formal. Their radicalism lay not in their form but in their mobilisation of geographical facts and commentary in his pursuit of a new political project. Here we bring into view the dual definitional difficulty confronting any account of radical cartography. What do we mean by radical, and how do we define a work of cartography? It may well be that worrying over such matters is beside the point. Radicalism in cartography, as in any other artistic work, can be present either in the form of the work itself or in the message it seeks to convey (and both). The quest for a strict definition of radical cartography can never be settled, just as the boundaries of the radical are changeable and unfixed. Similarly, and especially in the days of Geographical Information Systems, one person’s map can be another’s annotated photograph. It is better, I think, to treat radical cartography as a mode of political and aesthetic practice, the success of which can only be decided once a map has begun to circulate in the world. Maps cannot be hermetically sealed off from the world at large, and their potential radicalism stems as much from their use by social movements and campaign groups, as from what they themselves represent. 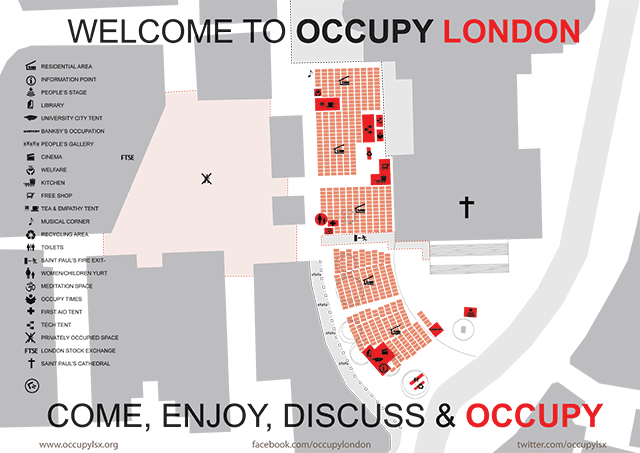 Aesthetically formal and simplistic maps, such as those used to organise the Occupy LSX encampments, can be radical when they are used as a tool for social change. In the days of Geographical Information Systems, one person’s map can be another’s annotated photograph. It may well be that in some circumstances our very definitions of cartography are what need to be radicalised. Nikolas Huffman, for example, has argued that “traditional cartographic practice has been constructed as a masculinist enterprise.” Yet efforts to radicalise cartographic practice exist. Take, for example, Kathy Prendergast’s Body Map series. In arguably the most famous set from that series, To Alter a Landscape, Prendergast uses cross-sections of the female body and intersects them with features from the physical landscape, drawn in the style of Victorian landscape maps. Catherine Nash has argued that Prendergast’s drawings depict “the processes of exploration, description, alteration, and control of a landscape,” but that the use of the female body as the setting for conquests over and explorations within the natural landscape engage the viewer in an active questioning of the extent to which the female body is itself subject to such processes. Prendergast’s drawings both encourage us to question the status quo, and undermine the formal structures of cartography itself. Cartography can, though, produce radical effects without adopting radical aesthetic forms. Take Léopold Lambert’s Infrastructural and Militarized Cartography of Gaza that was produced in the early days of Operation Protective Edge, Israel’s assault on Gaza in July-August 2014. Lambert’s map and accompanying text urge the viewer to consider both the emotive force of spectacular incidents of violence—bombing raids, drone strikes—and the more mundane, everyday articulations of violence through which a population is controlled and reduced to a state of bare life. Death counts from recent conflicts in Gaza are featured on the map, alongside statistics highlighting the lack of electricity, clean water and other everyday essentials in the lives of Gaza’s residents. This everyday and spectacular violence intersect in places such as hospitals, where the victims of military assaults struggle to be treated due to shortages of power, water, medical and other resources. Lambert, again, self-consciously reflects on the function of cartography itself. “Let it be clear,” he writes, “making maps won’t save any life [sic].” Yet by mobilising knowledge about the world, presented in a cartographic form that is easily understandable and interpreted, and which can circulate rapidly across the internet, Lambert created an aesthetic work whose political effect was to highlight the profound violence experienced as a matter of routine by the residents of the Gaza Strip. The Atlas of Radical Cartography is a contemporary resource through which to think about the political implications of radical cartography. Take, from that collection, Ashley Hunt’s A World Map: In Which We See. Hunt takes as his terrain the manner in which explicit violence, everyday surveillance and infrastructural discipline seek to create a compliant consumer-class of citizens whose daily lives are spent trapped within the circulation of capital. Hunt’s world map is not concerned with representing the locations of countries and cities, mountains and rivers. Instead, it charts and clarifies the social and political relations that constitute the world as we experience it. On his map he includes a quote from the geographer Ed Soja, which is worth quoting at length: “All social relations become real and concrete, a part of our lived social existence, only when they are spatially inscribed—that is, concretely represented—in the social production of social space.” In an era when complex infrastructural technologies and mechanisms of surveillance are mobilised for purposes of surveillance and social control, it can be the task of cartography to expose that which is conventionally hidden. By challenging conventional understandings of the status quo and providing succour for political movements seeking to change the world, radical cartographers are able to use geographical knowledge and the methods of visual representation to provoke questions about the everyday geographies of the world, and most importantly, the structuring of world power. This is surely the legacy that J.F. Horrabin would have been be glad to see continue into the future. Daniel Whittall teaches Geography at a secondary school in Bracknell, and writes on the relationship between politics and geographical knowledge.